Peel, core and roughly chop the apples. Put in a large pan with 1 tbsp water over a low heat. Cook for 10 minutes until the apples are soft, but not collapsed. Add sugar to taste, then add the blackberries, stir, and remove from the heat. Butter the slices of bread well on one side. Use two thirds of them to line a 1 litre-capacity pie dish, placing them butter-side down and cutting to fit. 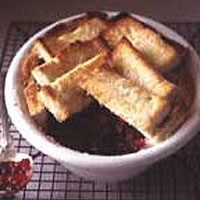 Fill the dish with the blackberry and apple mix. Cut the remaining bread into rectangles and use to cover the filling, butter-side up. Sprinkle with more sugar. Bake for 45 minutes or till golden and crisp. Serve immediately with cream or custard.